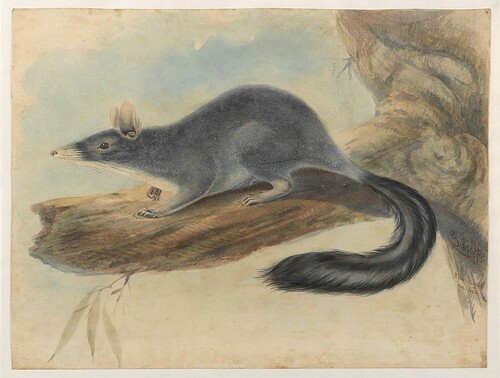 Gerard Krefft (1830-1881) was a zoologist, artist, curator of the Australian Museum in Sydney and correspondent with Charles Darwin and Sir Richard Owen. 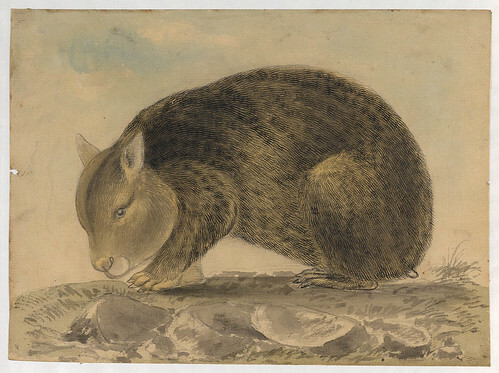 A collection of thirty five of his watercolour drawings of native animals and Aborigines has been digitised by the State Library of NSW (note the thumbnail link). 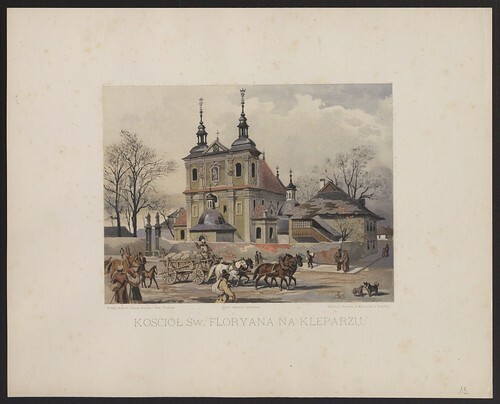 The drawings were originally single works that were offered for sale after Krefft's death. 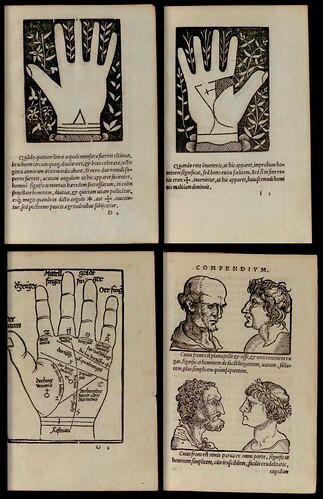 From: 'Physionomiae et Chiromantiae Compendium', 1536, by Bartolommeo della Rocca Cocles [source]. 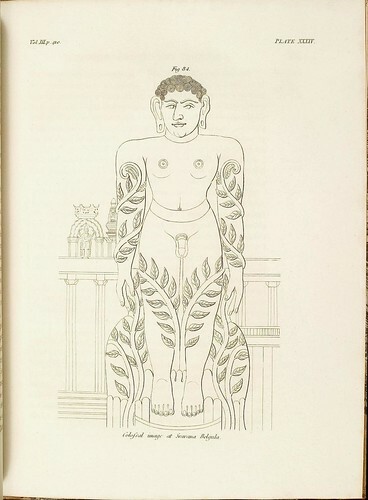 The first forty pages are standard fare physiognomy heads; then there are more than a hundred pages of palmreading (chiromancy) woodcut illustrations. 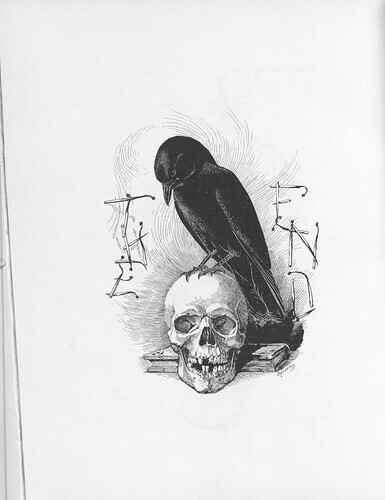 Final page in 'The Cornellian' (magazine) of 1896: the Raven & Skulls illustration is by Louis Agassiz Fuertes. 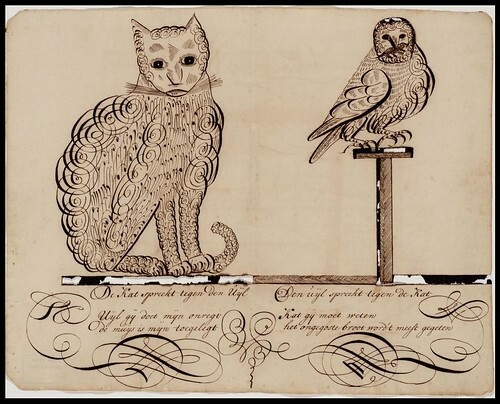 The above images were sourced from the Cornell University Rare Book and Manuscript Collections. 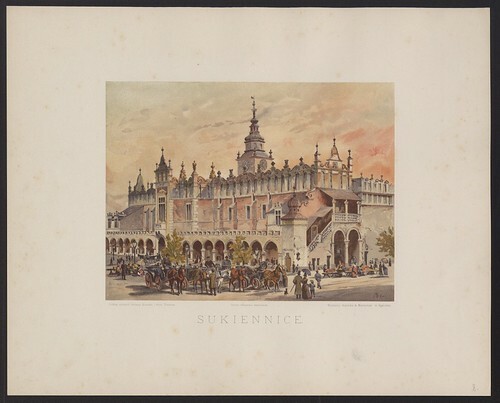 IN: 'A Journey From Madras Through the Countries of Mysore, Canara and Malabar' by Francis Buchanan, 1807 [source; also at googlebooks]. From: 'A True Relation of the Unjust, Cruell, and Barbarous Proceedings Against the English at Amboyna in the East-Indies', 1624. The multi-page pamphlet - [source] - records the torture and execution for treason of employees of the British East India Company by the Dutch East India Company; known as the Amboyna Massacre (Ambon island, Indonesia). 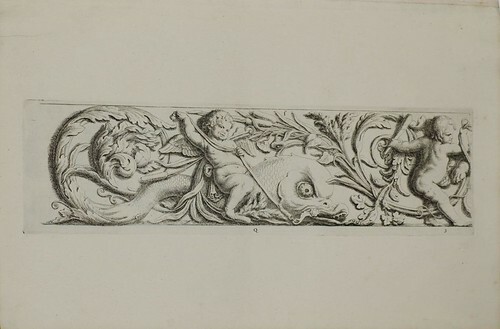 From: 'Les Arts & Métiers en Images. 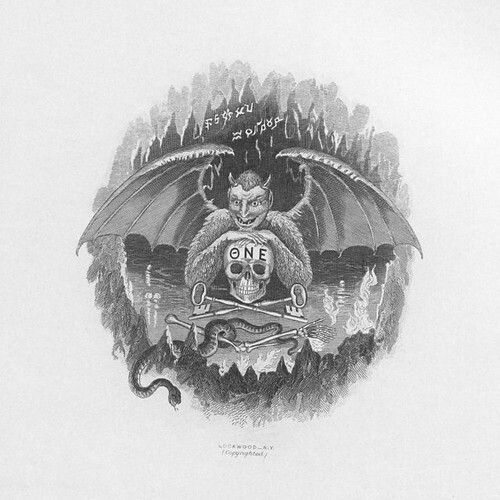 Exposé des Procédés les Plus Usuels, à l´Usage de la Jeunesse', published by Tasoli & Ohlman, 1859. 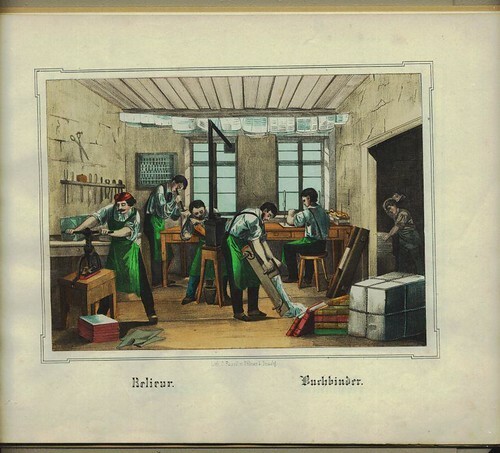 [source - click 'start'] This children's book depicts about thirty trades, all in bright-to-sometimes-garish coloured lithographs. 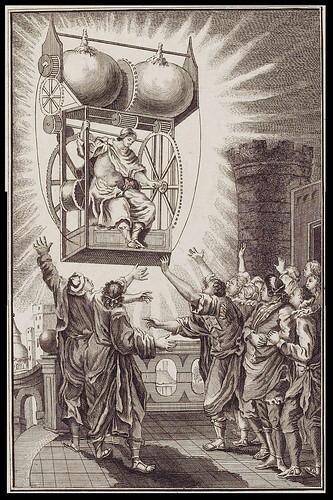 The illustrations are quite detailed. 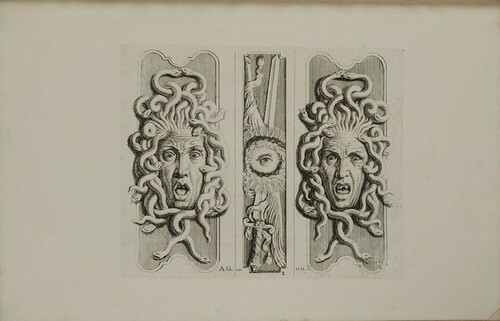 UPDATE: see this Princeton rare books blog post re: Louis Guillaume de La Follie. 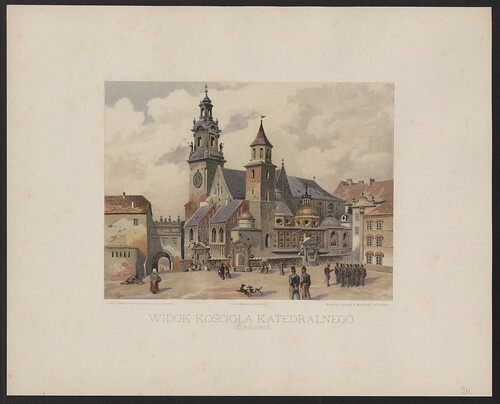 'Klejnoty Miasta Krakowa' by Juliusz Kossak, 1886. 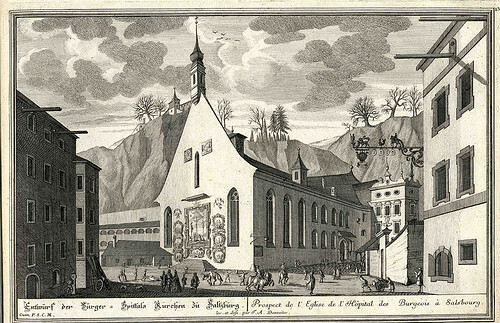 These Salzburg (Austria) views are from two works by Franz Anton Danreiter from the mid-17th century that are bound together in the version owned by the University of Salzburg Library. 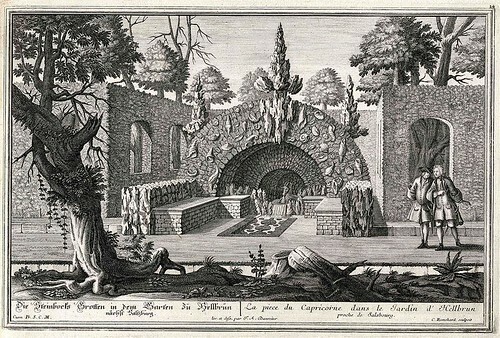 'Saltzburgische Kirchen-Prospect' and 'Garten-Prospect von Hellbrun' were featured in the book of the month site. 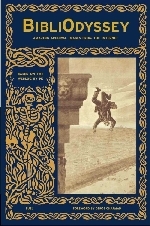 [Book of the month homepage] To my embarrassment I can't recall where I found this: either via Briefe an Konrad or Ortelius, both exemplary cultural blogs in German that I always mix up in my head. My thanks to Rev.JA. 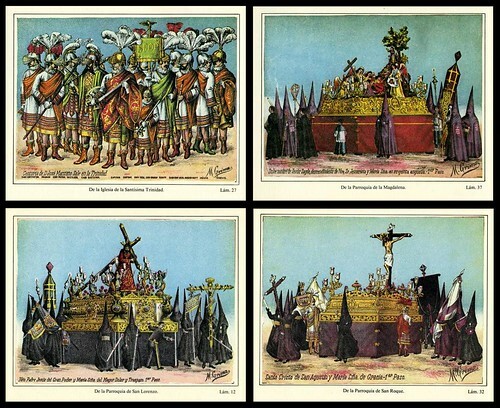 who passed on scanned illustrations of the Holy Week procession floats ('pasos') relating to the Passion of Christ biblical episodes. 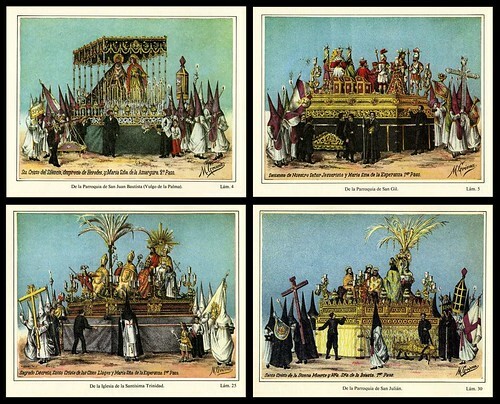 The event is held in Seville each year around Palm Sunday/Easter time and these cards (collected by children) were published by M. Grima in Barcelona in 1887. The hooded figures are penitents. 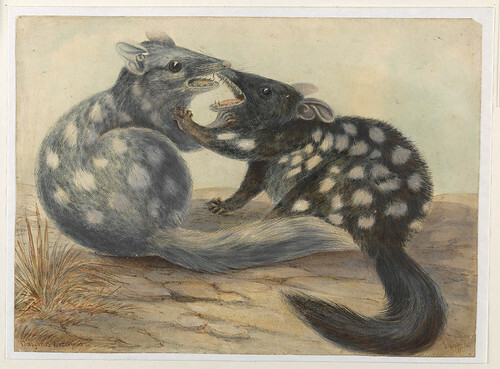 I'm afraid I have forgotten where these two images came from. 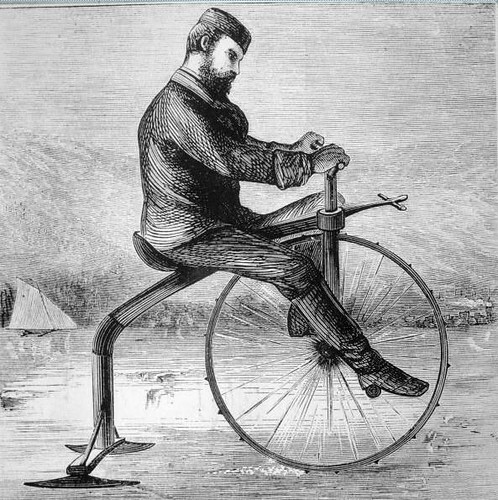 Both were published in the second half of the 19th century; the ice velocipede is from 1869. 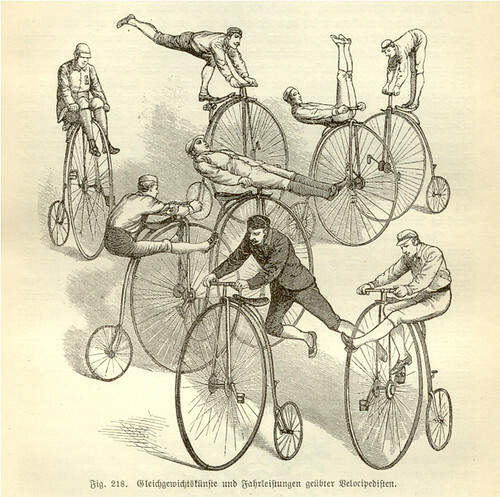 I remember thinking that there was a potential 'odd Victorian transport' post in the making and, although there are a large number of patents for variations on the 'bicycle' theme, I ended up deciding that there weren't enough decent quality illustrations around to keep bothering. In passing I did come across the Museum of RetroTechnology which is worth a browse. As is Old Bike Blog . 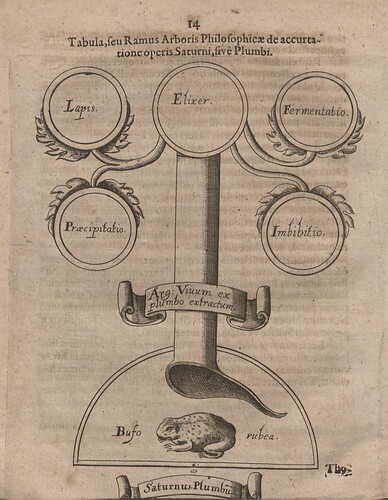 This obscure alchemy illustration is from a small publication by George Ripley from 1630, entitled: 'Saturnus Saturatus'. [source - click the book icon] Obviously readers are being told that to find the philosopher's stone, they must lick the back of a cane toad until intoxicated. Makes sense. 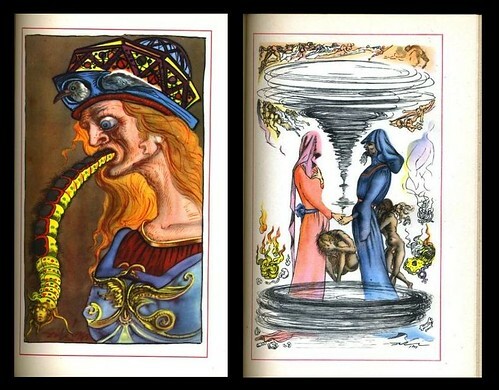 Salvador Dali illustrations IN: 'Autobiography of Benvenuto Cellini', 1948. 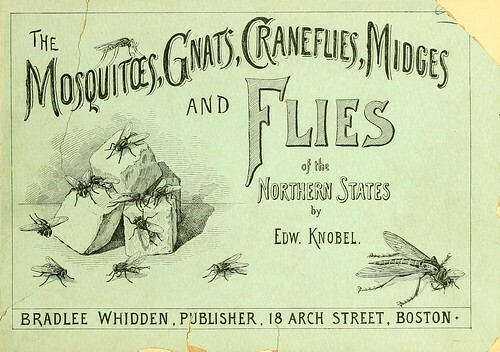 'Mosquitoes, Gnats, Craneflies, Midges and Flies of the Northern States', by Edward Knobel, 1897 [source] The cover designer has done well given the title name. 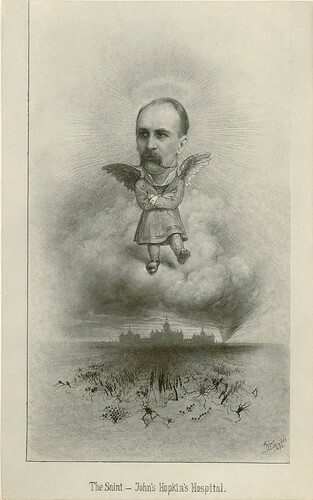 "This caricature of William Osler elevates him to holy status as he sweeps away disease with cyclonic force. The title, The Saint -- Johns Hopkins Hospital, is a play upon Osler’s frequent reference to the hospital as ‘the St. Johns’. The caricature, done in 1896, is by Max Broedel, the renowned medical illustrator." 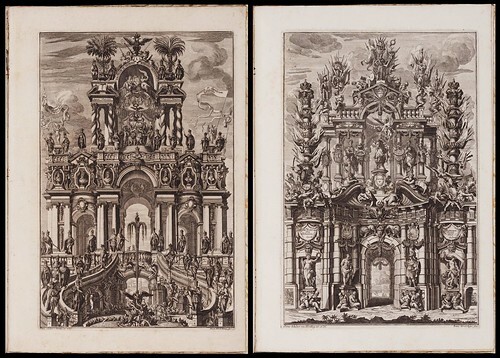 Like kryptonite to modesty, baroque triumphal arches feature in the 1725 publication by Antonius Bomer, 'Triumphus Novem Seculorum'. Early Modern at the Beinecke showcases another work from Yale's collection of Italian festival books and gives instructions for finding them. 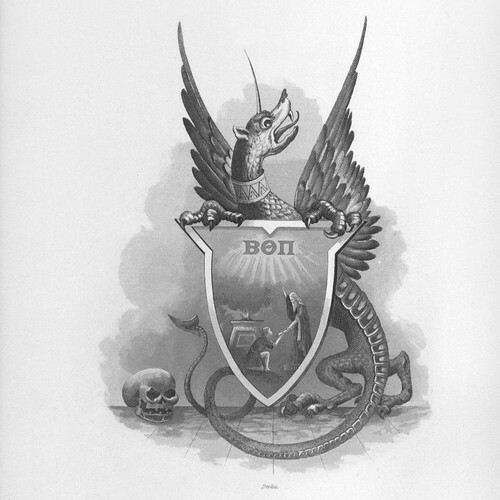 ...to find the philosopher's stone, they must lick the back of a cane toad until intoxicated. Everything is clear to me now. 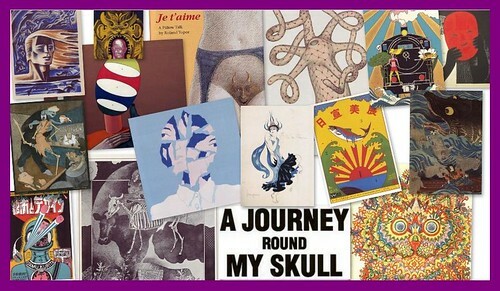 Zombies will also be discussing the jewels in the toads' heads, film at eleven.